This is an autobiography of a man who followed the example of his brave, assertive mother. 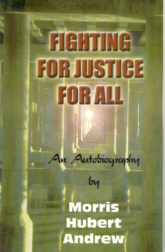 Mr. Andrew has fought for justice throughout his long and varied life. He has fought against racial discrimination in the military and in the workplace. He has fought for the rights of lieutenants, police officers, managers, and small business owners. Wherever he saw injustice, he attempted to right it, regardless of race, creed or color.